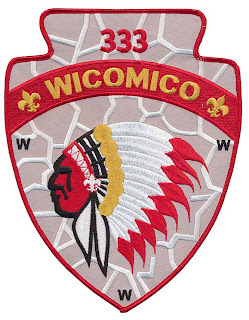 Wicomico Chapter of Wahunsenakah Lodge 333 recently issued two new arrowhead-shaped patches very similar to their prior A1 design. Although the design of the two new patches is virtually identical, the sizes are not. Both differ from the A1 in that FDL's have been added on either side of the Chapter name and three W's have been added in each corner of the lower section. The face of the Chief is now red rather than brown, probably to reduce costs by lowering the number of colors used in the design. A2 is 7" wide and 9" tall and designed as a jacket patch. A3 is 2.5" wide and 3.5" tall and classified as a pocket patch. An identical version of this patch is scheduled for release soon with a yellow border. The yellow border version will be sold to members and the red version to non-members of the chapter. You can view all of the Wicomico Chapter patches here. Thanks to Larry Johnson for the pictures and information. 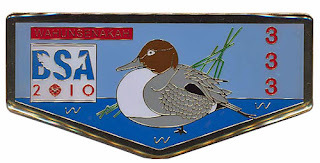 Wahunsenakah Lodge issued their first metal flap shaped emblem at their Summer Service event, held August 27-29 at Bayport Scout Reservation. The flaps were sold for $10 each, with only 250 made. The emblem features the 100th Anniversary of the Boy Scouts of America logo along with the Lodge's duck totem. This is the first metal issue by a Virginia lodge that I am aware of (feel free to correct me if I am wrong). Two North Carolina Lodges (Catawba 459 and Occoneechee 104) have issued metal flaps, as has Tisquantum Lodge 164 of Canton, Mass.